Free Shipping Included! Best Quality Furniture AC175 Upholstered Arm Chair by Best Quality at Momiji Studios. MPN: AC175. Hurry! Limited time offer. Offer valid only while supplies last. 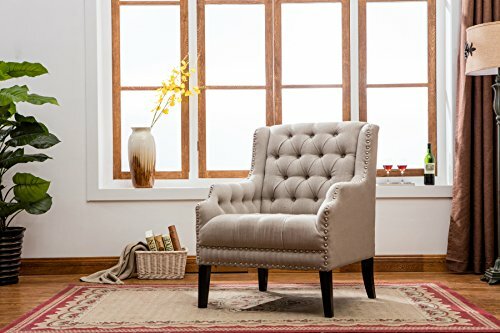 Decorate your living room with this beautiful upholstered arm chair. The chair is upholstered in a cotton look texture fabric in a Moonlight color. Decorate your living room with this beautiful upholstered arm chair. The chair is upholstered in a cotton look texture fabric in a Moonlight color. Tufted design decorate the inside of the arm rest as well as the back rest. Silver nailhead decorate along the sides of the chair and along the front. Comes with cappuccino color legs.